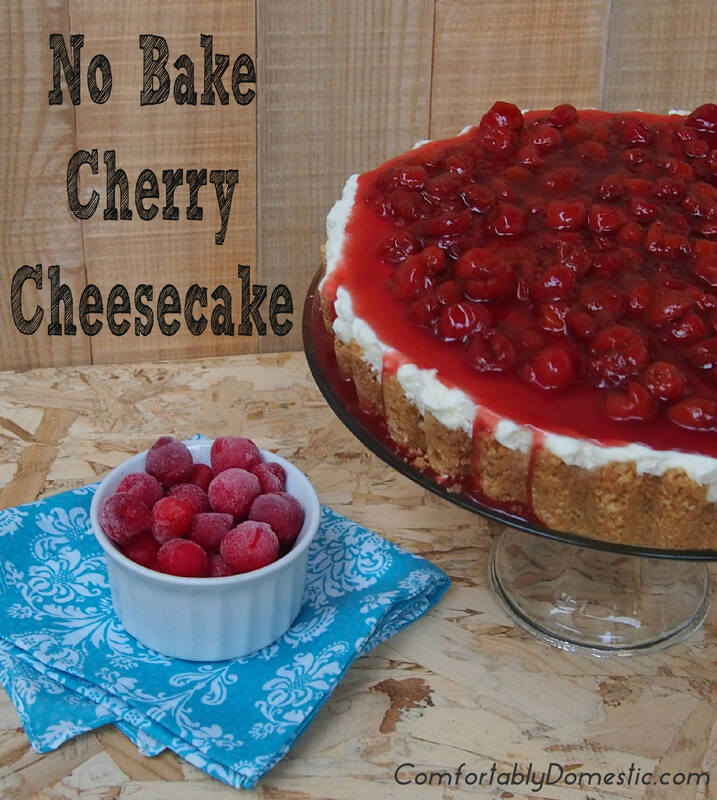 No Bake Cherry Cheesecake is a quick and easy dessert alternative to traditional cheesecake. 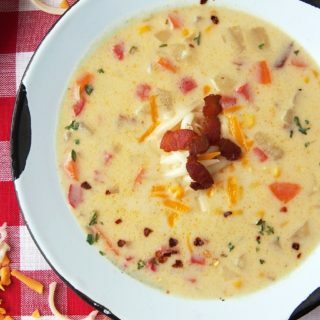 Get all of the rich flavor, without all the work! Hey there, Friends! 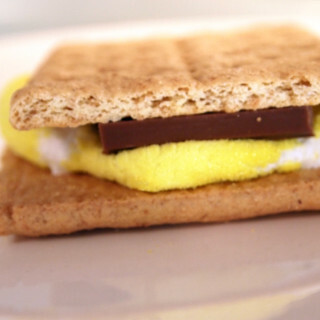 Since it’s the eve of Thanksgiving, I thought I’d share a super easy dessert recipe today. You know, just in case the holiday came up on you and the last minute decision of what to make for dessert tomorrow is nipping at your hiney. No Bake Cherry Cheesecake is the perfect dessert to put you at ease. It comes together quickly, has all the rich flavor of cheesecake, but a whole lot less of the fuss associated with baking the perfect cheesecake. Besides! No Bake Cherry Cheesecake is so light and fluffy, you’ll hardly feel like your gorging yourself after your Thanksgiving feast. 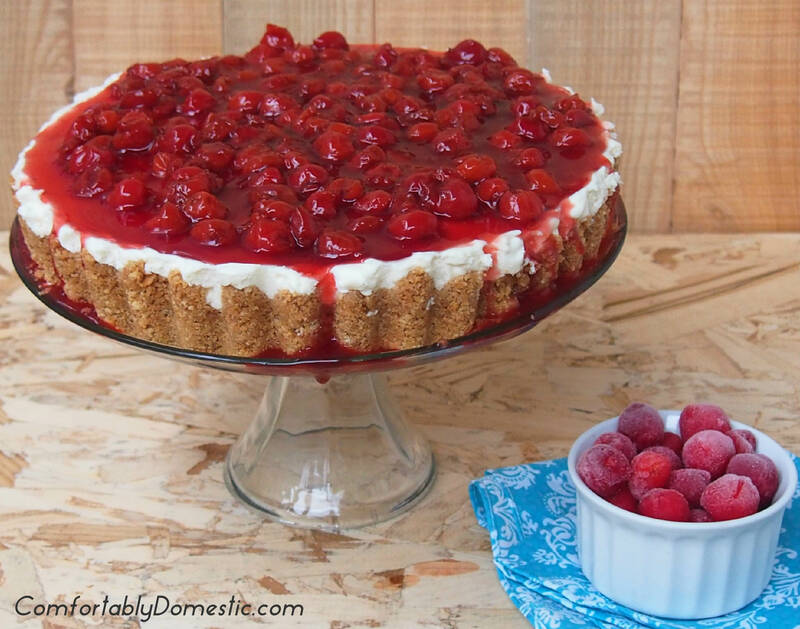 In my world, that means you can have two slices of this no bake cherry cheesecake. So even if you’ve got the Turkey Day menu nailed down, consider adding just one more sweet morsel to share with your loved ones. They’ll thank you for it. A quick and easy no bake alternative to traditional cheesecake. All of the flavor without all the work! Yields a 9-inch or 10-inch cheesecake. Stir the graham cracker crumbs and brown sugar together with a fork to combine; make a well into the center. Pour melted butter into the graham mixture and stir with a fork until it is entirely moistened and clumps begin to form. Press the graham mixture evenly onto the bottom and one inch up the sides of a 9 or 10 inch tart pan with a removable bottom. Refrigerate the crust for 20 minutes, or until set. Beat cream cheese with the vanilla in a large bowl with an electric mixer set on medium speed, until it becomes very creamy and smooth. In another bowl, whisk the heavy whipping cream with the powdered sugar until stiff peaks form. Gently fold the whipped cream into the cream cheese mixture until well blended. Spoon the filling into the chilled crust, smoothing to level the top. Chill the filling in the crust for a minimum of two hours, preferably overnight, until set. Place pitted cherries into a mesh strainer set over a large bowl to allow a little juice to drain. (Frozen cherries may be used, if thawed completely before using. Thaw frozen cherries in a strainer set over a large bowl, too. Measure the frozen cherries after they have thawed.) You should get enough juice for the recipe whether using fresh or frozen cherries. Remove from heat and fold in the cherries. Transfer the cherry topping to a glass bowl and allow to cool to room temperature. After sufficiently chilled, carefully push the bottom of the cheesecake out of the tart pan, setting the bottom of the tart pan onto a serving plate. Spoon the cherry topping over top of the cheesecake. If a little of the filling runs down the side of the cheesecake, that’s okay—it just adds to the drama of the presentation. Let the cheesecake come to room temperature for 20-30 minutes before slicing. Want another no bake dessert recipe? No problem! No Bake Lemon Mousse Tart – with a pretzel crust! If you want more cheesecake recipes to bake, I’ve got you covered, too! 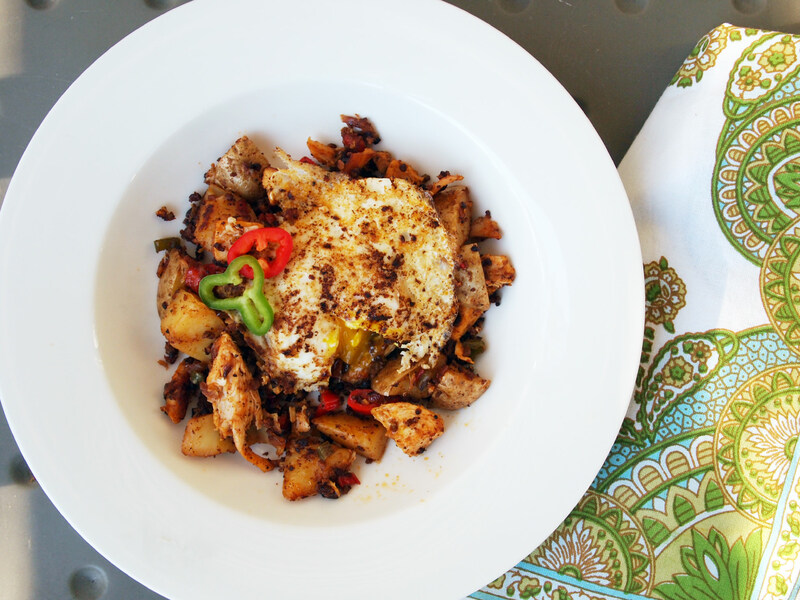 After Thanksgiving, put all that leftover turkey to good use by brunching on Turkey Hash with Chorizo and Eggs. We’re talking seriously good stuff here! However, if you’re all turkeyed out, or leftovers just aren’t your thing, might I suggest Maple Bacon Waffles? They’re the perfect fuel after a day of gluttony. Yum, all of it, just YUM! Haha! Thank you, Friend. I think I'm more excited for the turkey hash leftovers than I am for the actual turkey dinner. 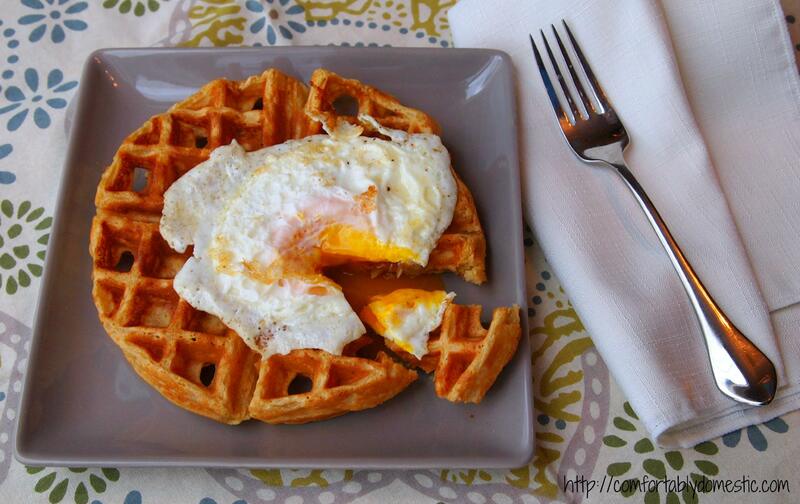 I really liked the looks of that egg on the waffle....I have a few days off work, time to make special breakfasts!